View More In Mixers & Accessories. 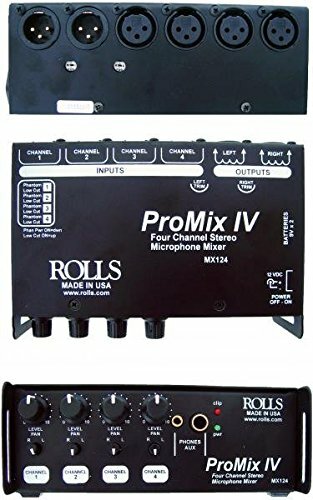 The Rolls MX124 Pro-MixIV mixes 4 microphones into two transformer balanced outputs. It has four XLR inputs, each with individually switchable phantom power, and Low Cut switches (100 Hz high pass filter), a Level control, and a Pan control. As mentioned, it has two transformer balanced, XLR outputs. A 1/4 inch Aux/Headphone output has been provided along with a Clip indicator, Power indicator, and Power switch. The unit is also powered by two 9-Volt alkaline batteries or the included 15VDC power supply. If you have any questions about this product by rolls, contact us by completing and submitting the form below. If you are looking for a specif part number, please include it with your message.